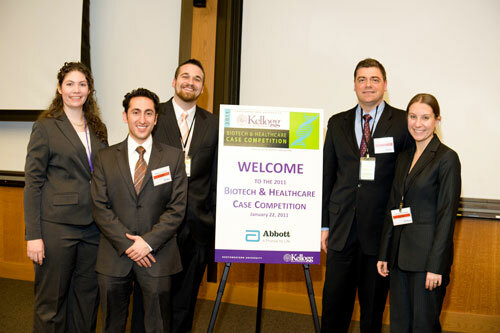 Newark (January 27, 2011)  A team of Pharmaceutical MBA students won the 8th annual Kellogg Biotech & Healthcare Case Competition on January 22 beating 11 other top business schools including Harvard, Tepper, Berkley, Kellogg, and the London Business School. From left to right "Team Rust" from Rutgers Business School: Jennifer McGann, Michael Sarshad, Brandon Saks, Dejan Milentijevic, and Laryssa Wozniak. The winning Rutgers Business School (RBS) team consisted of Brandon Saks, Dejan Milentijevic, Jennifer McGann, Michael Sarshad and Laryssa Wozniak. The team was given one week to forecast a newly launched pharmaceutical compound and spent 18-hour days working together to come up with an executive-level presentation. Judged by executives from Abbott Laboratories, who sponsored the competition, the Rutgers team gave a “flawless presentation” according to the judges to win the competition unanimously. "Our team really gelled together the last 24 hours," said Wozniak. "We had the idea in our heads but it really started to come to life," she said, adding that the Rutgers team outworked the other schools by rehearsing what they were going to say right up to 10 minutes before their presentation. The team also credited their success to their diverse backgrounds, each having pharmaceutical industry experience, and conferring with Rutgers alumni in the biotech industry. "This win shows that Rutgers Business School belongs among the top business schools," said Saks. "It was an unbelievable experience to see the respect we earned from the biotech and healthcare companies and the other business schools." Through the leadership of Professor Mahmud Hassan, Director of the Pharmaceutical Management MBA Program, the support of the Blanche and Irwin Lerner Center for the Study of Pharmaceutical Management Issues managed by Ingrid Castillo, and strong industry partnerships with Bristol-Myers Squibb, Eisai, Johnson & Johnson, Merck, Novartis, Roche and Schering-Plough (now part of Merck), Rutgers has been offering cutting-edge research and training in pharmaceutical management for over 10 years. "One of the things that makes the pharmaceutical management program so special is to see how active our students and alumni are with student clubs, alumni clubs, to stay connected," said Hassan. The Rutgers Pharmaceutical MBA team won $5,000 for a presentation that featured "compelling analytics and sharp strategic thinking," according to a statement from the Abbott judges. Second place went to a team from Haas School of Business, UC Berkeley, and third place went to a team from Kellogg. Two teams received an honorable mention: Harvard and Notre Dame. The hard-earned victory by Brandon, Dejan, Jennifer, Michael and Laryssa, showcases the best of Rutgers Business School as a leading business school in pharmaceutical management. Laryssa Wozniak is a graduate of Boston University and a member of the "Plast" Ukrainian scouting sorority "Verkhovynky."